Tell us Now! There's an App for That! You’re shopping, or you’re getting gas; you get back into the car, double-check your receipt and realize you’ve been overcharged. Or you’re leaving the house and see that abandoned car still sitting there, or a fresh new splotch of graffiti. If only there was an app for that, right? Some tool that would let you snap a quick photo, add some text and immediately alert someone to fix the error or clean up the mess. There is! We’ve called it “Tell Us Now!” and it can be downloaded for free. We’ll be making a public announcement about it soon, but we wanted to share the word with employees first and encourage you to give it a try. Our Land Use and Environment Group departments already provide great customer service to the people who call and email us with questions and complaints. But “Tell Us Now!” is going to make our customer service even better. It will make our systems faster. The public can submit complaints and questions immediately — when they see them — and directly into our LUEG departments computer systems. It will also let them track the progress of their complaints as we look into them. County employees, meanwhile, will have more information such as pictures to conduct investigations and will be more efficient since they won’t have to type people’s information into the system. In the coming months, we plan to add more options into the “Tell Us Now!” app’s capabilities, including pothole, street signs and other road questions. 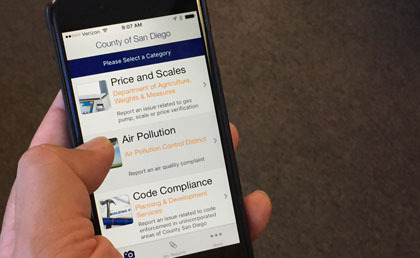 But to start, the app will allow the public to submit questions about pricing, overcharges, air quality region-wide and Code Compliance issueswithin the unincorporated area. That should be substantial. Every year we get more than 350 calls and emails looking for help with overcharges from inaccurate prices and scales; roughly 800 air quality complaints (weird odors, illegal burns, etc.) and about 3,000 Code Compliance complaints about trash, junk cars, illegal business operations and the like. Say you want to report a gas pump at a station that overcharged you. Maybe the pump continued to charge even after the gas stopped flowing. So download the app! It’s available in the Apple or Google Play stores and ready to be used! Search for Tell Us Now!